With no rains in sight, at least in the near future, and temperatures rising over plains of the country, the UK Met Office’s prediction of 2007 to be the hottest year ever appear to be coming true for India. Concerned over millions of patents across the world “losing access to affordable medicines produced in India”, diverse groups, including the Indian Network for people living with HIV/AIDS and the People’s Health Movement, are coming together in the Capital tomorrow to urge pharmaceutical MNC Novartis to drop its patent case against the Indian Government. Noted Hindi writer, and veteran journalist Padmabhushan Kamaleshwar passed away here last night. The veteran Hindi writer died of cardiac arrest at the age of 74. He is survived by his wife and a daughter. 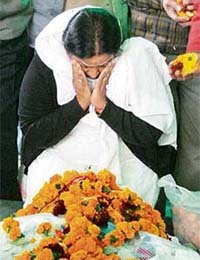 Daughter of noted writer Kamleshwar, who died on Saturday night, pays homage to her father before the cremation in New Delhi on Sunday. The proposed IIT (Indian Institute of Technology) for Andhra Pradesh has become a bone of contention between the ruling and opposition parties over its location. While Chief Minister Y S Rajasekhara Reddy is bent on setting up the prestigious institute at Sangareddy in Medak district, which is some 60 km from the city. Veteran music director O.P. Nayyar, who was the toast of Bollywood through the 50s, 60s and early 70s, died today at the residence of his close friend Rani Nakhwa in Thane following a heart attack. He was 81. Orissa’s tableau, depicting progress made by the toy industry in the state, has been adjudged the best tableau in this year’s Republic Day parade in the Capital. Defence Minister A.K. Antony gave the awards at a function here. The tableaux on the Republic Day parade are generally meant either to depict rich culture or portray government’s achievements, but it was altogether a different experience for the Munger district administration. The Union Home Ministry has convened a meeting of Chief Secretaries of all states here on February 1 in context of the Supreme Court’s directions for expediting police reforms and amending the Police Act of 1861. An exclusive off-track and off-beat restaurant. Rani Mukherjee -the husky babe. As far as plains of northwest region, including Punjab, Delhi, and Haryana, are concerned, rains have eluded most parts. The "no-weather" effect, as in weathermens' parlance, is being seen in hills of Himachal Pradesh as well. Concern for the prevailing weather conditions in the state has even prompted a five-day yagna for rain and snowfall at the famous Jakoo temple in Shimla. Zone-wise weather prediction by the National Centre for Medium Range Weather Forecasting (NCMRWF) is that night temperatures will rise all over the country and mainly dry weather prevail. For the northwest in particular, the NCMRWF predicts a likelihood of “isolated rain or thundershower over Punjab, Haryana and West Utter Pradesh and mainly dry weather over rest of the region”. For Jammu and Kashmir, Himachal Pradesh and Uttrakhand, it says isolated to scattered snowfall or rains is likely. Though no exact figures are available right now, weathermen say this season may be one of the driest-ever winters ever, all indicative of imminent global climate change. In the Himalayan region of Uttrakhand, temperatures have shot up abruptly, raising concerns among weather experts and the tourism industry alike. The region is usually in the grip of bitter cold wave during this part of the year. The long dry spell has also affected the Ganga with the hold river witnessing receding water flow at Hardwar. Dry weather and rising night temperatures in the plains of Haryana, Punjab and Delhi has been a cause for concern among farmers of the wheat belt. The minimum temperatures have been three to six degree Celsius above the normal in most parts of this area. In Himachal, temperatures have dropped marginally, but warmth continued. Shimla has been experiencing unusually warmer and with rain and snow eluding the state and temperatures rising, the climate has been proving to be a big disappointments for apple growers as well as the tourism industry. The NCMRWF has predicted the prevailing night temperature scenario to continue during the next 48 hours. The only silver lining is that thereafter, temperatures are likely to fall as a fresh western disturbance is likely to affect western himalayas during June 29 and 30. With this, isolated to scattered snowfall or rains are likely over Jammu and Kashmir, Himachal Pradesh and Uttrakhand along with isolated rain and thundershower over Puinjab, Haryana and West UP. As per the met office, night temperatures have been appreciably to markedly above normal in UP, Uttarakhand, Haryana, HP, Madhya Pradesh and some parts of Rajasthan, Gujarat , Madhya Maharashtra, Marathwada, Telangana, Rayalseema, Tamil Nadu and Karnataka. They have been above normal in Konkan and Goa, parts of Nagaland, Manipur, Mizoram, Tripura, sub-Himalayan West Bengal, Sikkim, Kerala and remaining parts of Rajasthan and Marathwada. Together with the Center for Trade and Development and Medicine Sans Frontiers (MSF), the sole aim of tomorrow's campaign will be to urge Novartis to drop the case against India on the plea that not just India but millions of patents across the globe will be affected. The pharmaceutical major sued the Indian Government and its patent law after its application for patent for anti-cancer drug Gleevec was rejected by the Indian Patents Office, saying that the drug was a new form of an old drug and therefore not patentable under the Indian law. Six months after its patents application was rejected by authorities concerned, Novartis moved the Chennai High Court, challenging a crucial part of the country’s patent law which prevents grants of patents to existing drugs in a new form, use or combination and limits the patenting of pharmaceuticals to actual innovations. Novartis filed two petitions in May, 2006, one challenging Constitutional validity of the law and the second challenging the Indian Patent Office. The case is coming up for hearing in the division bench of Chennai High Court tomorrow. While legal experts have been questioning the jurisdiction of the pharma MNC over suing India over a law passed by the Parliament, public health agencies have been providing support through campaigns, saying that no company should stand in the way of people’s right to access the medicines they need. All medicines available in developed countries are available in India and the country has emerged as a major pharma market for many developing countries across the globe, they add. Admitting that it could perhaps be one of those unique occasions when NGOs and people’s groups are actually coming out in support of the government, group’s spokespersons say that India is a crucial source for affordable medicines for many developing countries and the country's law contains elements that puts people before patents. Noted Hindi writer, and veteran journalist Padmabhushan Kamaleshwar passed away here last night. The veteran Hindi writer died of cardiac arrest at the age of 74. He is survived by his wife and a daughter. A long-time heart patient, Kamaleshwar’s condition deteriorated at his residence last night, the family sources said. He breathed his last while being rushed to the hospital. Author of acclaimed ‘Kitne Pakistan’; the writer was born on January 6, 1932 in Uttar Pradesh. He had an association with Doordarshan as an Additional Director-General and worked as the Editor of Hindi daily Dainik Jagran. Kamaleshwar was today consigned to the flames in the presence of hundreds of his followers, fans, colleagues and peers. His grandson Anant lit the pyre. The ‘pen man’ of eminence, whose ‘Aandhi’ stirred much controversy in the 70s leading to its ban, was cremated at the Lodhi Road crematorium here. Despite a galaxy of well-known writers, artists and journalists marking their presence to pay the ‘working genius’ their last respects, conspicuous was the absence of any known face from Bollywood - the industry for which Kamaleshwar wrote scripts for about 100-odd films. Several writers and critics like Ashok Vajpayee, Mahesh ‘Darpan’, Mahip Singh, Pradeep Pant, Rajendra Yadav, Madhukar Gangadhar, Asgar Bajahat, Padma Sachdev, his ‘colleagues’ from Doordarshan and All India Radio and from the media fraternity like Alok Mehta and Prabhash Joshi offered floral tributes to him just before the last rites were performed. Among those present from the political sphere were Sitaram Yechury, Suresh Pachauri and Janardhan Dwivedi besides social activist Swami Agnivesh. Known for his ‘parallel agitation’ of 1970s which affected writings in several Indian languages, Kamaleshwar, whose recent hard-hitting novel ‘Kitne Pakistan’ attracted a wide range of critical appreciation from all corners, also carved a niche for himself on the small screen with big time hits like ‘Yug’ and ‘Chandrakanta’. The proposed IIT (Indian Institute of Technology) for Andhra Pradesh has become a bone of contention between the ruling and opposition parties over its location. While Chief Minister Y S Rajasekhara Reddy is bent on setting up the prestigious institute at Sangareddy in Medak district, which is some 60 km from the city, the opposition parties have intensified their protests against the decision. The opposition, led by Telugu Desam Party, has been demanding that the premier institute should be located at Basara, where a temple of Saraswati is located, in Adilabad district of the Telangana region. "A dharna would be held on February 1 along the NH 5 by all opposition parties against the decision," TDP Chief N Chandrababu Naidu announced today. Questioning the Reddy government's contention that airport and other infrastructure was lacking at Basara, Naidu said the place had been projected by successive governments including that of Congress as the ideal location in the past. "The backward region would get a momentum if the IIT is located at Basara. The fact is many existing IITs are located in smaller places, besides Basara also boasts of basic infrastructure," he pointed out. An IIT for Andhra has been a long-pending demand, as every year nearly 600-700 students from AP join IITs across the country. Interestingly, the state assembly had passed a unanimous resolution twice in the past, requesting the Centre to set up an IIT at Basara. However, when Reddy announced last month about the Centre's green signal for IIT in the state, he disclosed that the location would be the neighbouring Medak district because of its proximity to the city. Despite protests by the TDP as well as the TRS, he ruled out Basara, saying the temple town did not fulfil the necessary requirements to locate such an institute. While the TDP sees the location controversy as one more issue to embarrass the government, the TRS feels the decision was aimed at creating dissensions within regions of Telangana. In a curious twist to the controversy, the BJP MP from Nanded (Maharasthra) D.B. Patil, joined the chorus of protest, saying an IIT in Basara would benefit the backward regions of Andhra Pradesh, Maharashtra and Karnataka. Nayyar was estranged from his family and had moved out of his residence a few years ago. Nakhwa, a fan of his, virtually adopted the veteran music director. According to Nakhwa, the veteran composer, who was hale and hearty for most of today, went to the toilet late in the afternoon and collapsed inside. He died even before medical help could be summoned, Nakhwa told mediapersons. Nayyar was born on January 16, 1926, in Lahore and moved to India following the Partition. He got his first break in the film ‘Kaneez’ (1949). But O.P. Nayyar tasted success when he was noticed by the legendary Guru Dutt. After scoring hits with Dutt's ‘Aar Paar’ (1954), Nayyar never looked back. More hits like ‘Mr And Mrs 55’ and ‘CID’ followed. Nayyar's hits for other banners include ‘Naya Daur’ and ‘Kashmir ki Kali’. Nayyar virtually became the music behind Shammi Kapoor during his ‘yahoo’ days and delivered hit after hit through the 1960s. Among the big producers Nayyar scored music for include Raj Kapoor and Dev Anand apart from Guru Dutt. He is, however, not known for working with the nightingale of the Indian music industry Lata Mangeshkar as much as he is known for discovering her sister Asha Bhonsale. Legend has it that Lata Mangeshkar refused to work with the veteran music director for his proximity to her younger sister. Despite not having been formally trained in music, Nayyar scored a number of hits through the decades including ‘Kahin pe nigahen kanhi pe nishana’ (CID), ‘Mang ke saath tumhara’ (Naya Daur) and ‘Ello main hari piyan’ (Aar Paar), ‘Babuji dheere chalna’ (Aar Paar), ‘Mera naam Chin Chin Choo’ (Howrah Bridge), ‘Jaaiye aap kahan jaayenge’ (Mere Sanam). At the height of his career, Nayyar chose to become extremely discriminating about the directors he worked for. Working at a leisurely pace of one film a year, Nayyar delivered a string of hits for films like ‘Phir Wohi Dil Laya Hoon’ (1963), ‘Kashmir Ki Kali’ (1964) and ‘Mere Sanam’ (1965). Drawing heavily from Indian and Western musical traditions, Nayyar was not hampered by an absence of formal education in music. Nayyar's career, however, went into a deep decline after he broke with Asha Bhonsale in the 1970s. After bagging the Filmfare award in 1974, Nayyar slowly faded away and had to earn a living as a homoeopath. During this period, he was also estranged from his family and had to leave his residence at Churchgate till he was rescued by his fan. Goaded by friends, Nayyar attempted a comeback in the 1990s with ‘Zid’ and ‘Nischay’ starring Salman Khan and Karisma Kapoor. However, it was clear that the old times were really past and the new composers, several decades younger than Nayyar, were the new flavour of the day. Orissa’s tableau, depicting progress made by the toy industry in the state, has been adjudged the best tableau in this year’s Republic Day parade in the Capital. Defence Minister A.K. Antony gave the awards at a function here. The Ministry of Culture’s tableau on the theme of 100 years of satyagraha was declared the second best while the third best prize went to Maharashtra’s Jezuri, hill temple dedicated to lord Khandova near Pune. In schoolchildren’s cultural category, the Nagpur South Central Zone Cultural Centre won the top award with their Gedi dance, while Sarvodaya Kendriya Vidyalaya, Shakti Nagar, Delhi, won the second best award with their popular theme dance “Aao School Chale”. Dr Rajender Prasad Sarvodaya Vidyalaya in the President’s Estate won the third prize with their puppet dance. Soon after Building Construction Minister Monazir Hussain unfurled the tricolour and took salute during a Republic Day parade on Friday, two tableaux rolled down the venue depicting the poor state of education and kidnapping and murders of engineers involved in development projects. While the incident reportedly caught the officials unaware, the tableaux travelled half of the polo ground before they were ordered out. The tableaux were prepared by an NGO and the officials alleged they were completely kept in the dark of the proposed theme. However, the government has now asked the district administration to probe the matter and submit a detailed report by fixing the guilty. Union Home Secretary V.K. Duggal would preside over the meeting. The meeting comes a month after a meeting of Chief Ministers convened by Home Minister Shivraj Patil, ahead of the January 3 deadline of the apex court for the compliance of its directions on radical police reforms. The meeting would also be attended by Advisers of the union territories, whose administration comes directly under the control of the Union Home Ministry. The CISF marching contingent led by Assistant Commandant Nagendra Sharma has been adjudged the ‘Best Marching Contingent’ at this year’s Republic Day parade.